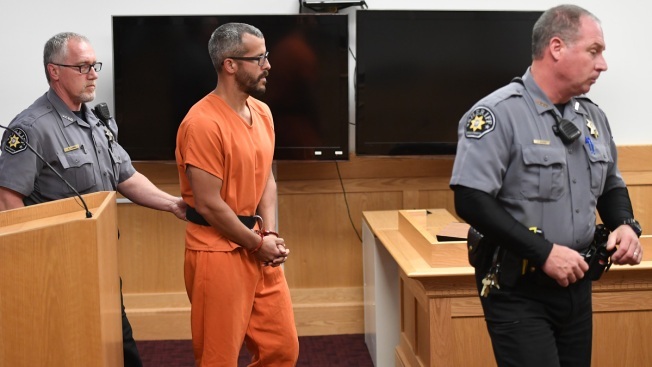 This Aug. 21, 2018, file photo shows Christopher Watts in court for his arraignment hearing at the Weld County Courthouse in Greeley, Colorado. Watts pled guilty on Nov. 6, 2018, to the murder of his wife and his two young daughters. A Colorado man charged with killing his pregnant wife and two daughters has pleaded guilty under a plea deal that will allow him to avoid the death penalty. Christopher Lee Watts was charged with five counts of murder Monday for the deaths of his wife Shanann Watts and their two daughters Bella and Celeste. Watts had initially pleaded publicly that his wife and daughters had gone missing. Their bodies were discovered on the property of the oil and natural gas company Watts worked for. The D.A. said that it's "too early" to discuss whether prosecutors would seek the death penalty.